Mid engine vs. Rear engine. Which handles better? This is where we venture beyond customary performance tests to decipher two of car enthusiasm’s enduring mysteries: Does spotting the engine in the optimum location—in the middle of the car—yield demonstrably better handling? And can engineering theory trounce painstaking practice? Porsche Cayman R, the hottest mid-engined model in Porsche’s current lineup, represents the theory side of the equation. This is the thinking man’s sports car—light, stripped, and hunkered down for utmost agility. Aluminum door skins, a bare-bones interior, carbon-fiber seat structures, and new 19-inch wheels hold the curb weight to 3076 pounds. Air conditioning and audio-entertainment equipment are optional. 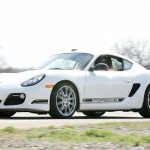 Porsche’s 3.4-liter, direct-injection flat-six has been goaded to 330 horsepower at 7400 rpm, a 10-hp gain over the standard Porsche Cayman S. While price doesn’t count in this analysis, the Cayman R starts at $67,250, a pocket-warming $12,700 less than a base 911. We tapped a Porsche 911 GT3—the proud son in an unbroken line of rear-engined Porsches dating back to 1948—to represent the practice-makes-perfect argument. 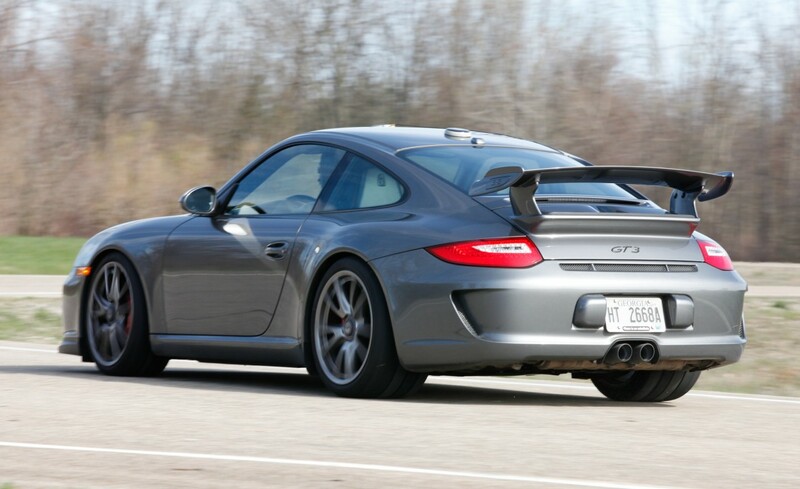 What the GT3 lacks in value (as-tested price: $130,910), it overcomes with pure grit. In terms of power-to-weight ratio, this is the second-hottest naturally aspirated Porsche money can buy (after the GT3 RS). The 435-hp, 3.8-liter flat-six and the six-speed transaxle powering this 911 descend from battle-hardened race hardware. Prepped GT3s compete in the Porsche Supercup, a Formula 1 support series. Decades of exorcising handling gremlins that come with hanging a 570-pound engine behind the rear axle have paid off in razor-edged reflexes. The latest fix is a $1300 set of dynamic engine mounts that cinch up during aggressive maneuvers to calm the GT3’s transient behavior. These road warriors are the ultimate examples of their respective 987/997 breeds. A seventh-generation 911, which will beget a new, third-generation Porsche Boxster/Cayman, is scheduled to bow at this fall’s Frankfurt auto show. To compile the evidence that would convincingly prove which engine location works better, we dug deeply into our box of tools. Cayman Dynamics, a team of vehicle-dynamics experts on call to support our more ambitious tests, cracked the door to a local laboratory where a million-dollar test rig measured each Porsche’s center-of-gravity height and polar moment of inertia [see “Engine-Location Glossary”]. Supplementing the normal acceleration, braking, and cornering tests, we lapped the Chrysler Proving Grounds road circuit where the Dodge Viper’s fangs were sharpened. All our tests were run with stability control disabled. To measure agility and predictability at the ragged edge of adhesion, we reconfigured the classic slalom test and cooked up a new step-steering-input maneuver. To monitor yaw rate and slip angle throughout our tests, we used a dual-antenna Racelogic VBOX II SXSL3 data logger. 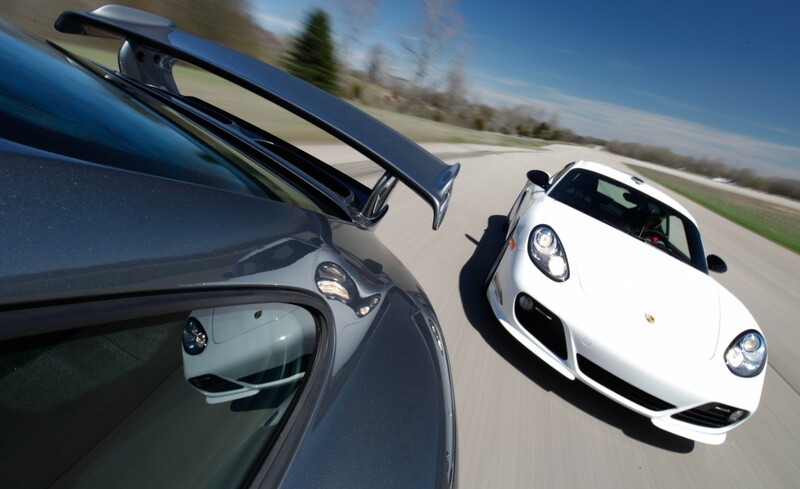 And, in celebration of Michigan’s endearing spring weather, we attacked a favorite local road with each Porsche to determine which was capable of posting the higher average speed on a 1.0-mile wet-pavement run. Theory says that for optimal performance, a sports car’s center of gravity (CG) should be as low as possible and closer to the drive wheels than the steering wheels. (Front-drivers read from a different chapter in the physics book.) To visualize polar moment of inertia, think of a figure skater spinning in a pirouette or a high diver tucking in limbs to accelerate rotation off the board. Now transfer those visions to a sports car: Concentrating the engine as close as possible to the vertical axis of rotation reduces the polar moment of inertia, theoretically making it easier to begin and end any cornering maneuver. Our lab tests revealed that the GT3’s CG height is a worthwhile 0.6 inch lower than the Cayman’s [see chart]. 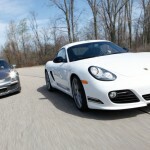 But that four-percent advantage pales in comparison to the Cayman’s 20-percent-smaller moment of inertia. Those figures tell you little on their own. But when we dig into the battery of dynamic tests, knowing the two Porsches’ inner secrets might help illuminate how one is able to trump the other. Even though the crux of this story is handling, it’s worth noting that the 911’s acceleration and braking superiority goes beyond its better power-to-weight ratio and its track-worthy tires. Accurately knowing the CG location in both cars reveals that the rear (driving) tires carry 74 percent of the 911’s weight during hard initial acceleration versus only 67 percent of the Cayman’s. (More load equals better launch traction.) 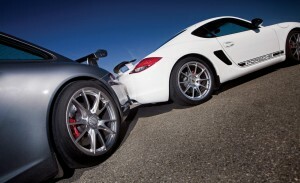 During braking, when nearly equivalent tire loading yields the shortest stops, the dynamic distribution is 58/42 percent, front to rear in the 911, versus 64/36 in the Cayman. Factor in the downforce provided by the 911’s rear wing, and the braking advantage swings further in its favor. Circulating a 300-foot skidpad at the limit of adhesion reveals the most fundamental facet of handling: the maximum-average grip (a.k.a. roadholding) available for cornering maneuvers. Under consistent throttle pressure, the 911 demonstrates a rock-steady lock on its cornering line. With a touch too much gas pedal, it slides predictably wide. 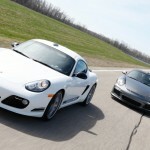 In spite of its second-place finish on the pad, the Cayman earned a moral victory attributable to its tires. In comparison to the 911’s sticky Michelin Pilot Sport Cup radials, the Cayman’s Bridgestone Potenza RE050A rubber has a narrower section width and a much less aggressive construction (intended more for general driving than track use). The Cayman R demonstrated excellent behavior, with linear responses to minor throttle and/or steering corrections aimed at holding the line. 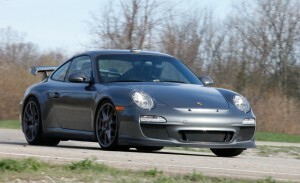 Win (barely): Porsche 911 GT3. To challenge agility, we created a new 610-foot slalom course with 10 cones spaced at increasing then decreasing intervals to mix acceleration and braking into the classic serpentine maneuver [see diagram]. 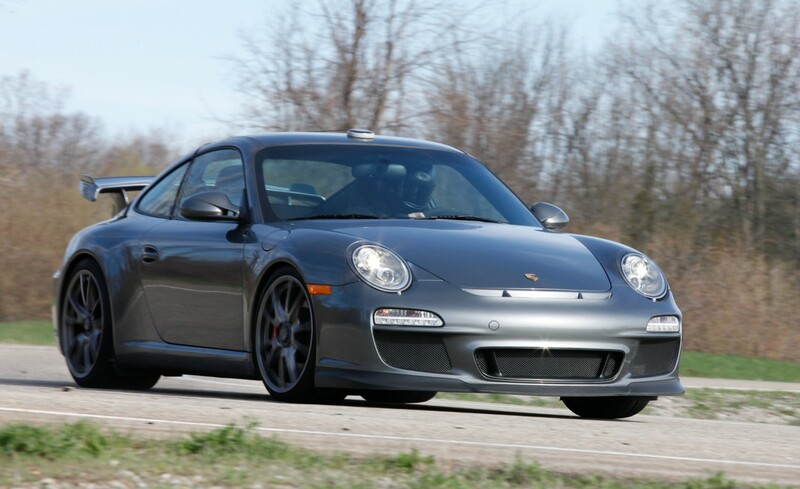 Thanks to its shorter wheelbase and superior tires, the GT3 reigned supreme in this event with an average speed of 49.9 mph, exactly 2 mph quicker than the Cayman R. The 911’s speed varied nearly 15 mph on this course versus about 12 mph of variance for the Cayman. The 911 loved being tossed through the tighter gates, while the Cayman worked best with smooth, patient hands at the wheel. The Cayman’s fluidity and narrower rear width were key assets. Our instruments revealed that both Porsches achieved peak grip of 1.11 g; the Cayman’s maximum slip angle was again nearly double that recorded by the 911. Win: Porsche 911 GT3. 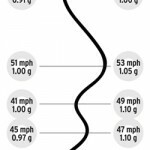 In an attempt to negate the 911 GT3’s 19-percent pounds-per-horsepower advantage, we whittled Chrysler’s Evaluation and Handling Course down to a tight, 0.42-mile squiggle containing three right turns and three left turns [see diagram]. That did not stop the 911 from trumping the Cayman by 2.0 mph. The 911 won, thanks to its holy trinity of advantages: better acceleration, braking, and cornering. It was easy to rotate the rear-engined car into every bend under trail braking, and it rocketed onto each short chute as if boosted by an afterburner. The GT3 recorded peak cornering of 1.20 g versus the Cayman’s 1.13 g.
The Cayman’s more relaxed demeanor makes it easier to drive. While the steering is slightly lighter in the Cayman than in the 911 GT3, road feel at the wheel is comparable in both Porsches. During dozens of two-direction passes, neither of our pair of test drivers dropped a wheel or came close to a spin. Both Porsches are primed and ready for track-day use by drivers ranging from rank amateurs to seasoned pros. Win: Porsche 911 GT3. 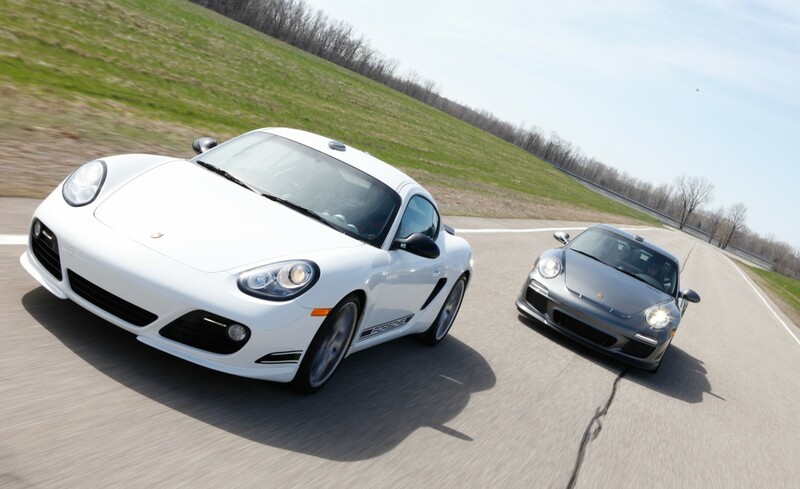 To determine just how aggressively these Porsches could be tossed into bends, we conducted a step-steering test at Chrysler’s vehicle dynamics (skidpad) facility. Our procedure had us achieving a target speed before abruptly snapping in and holding exactly 90 degrees of steering. 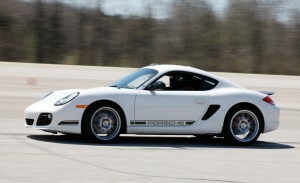 Starting at 35 mph, we climbed the velocity ladder until each Porsche showed nervous behavior. No steering corrections were allowed. Our test equipment revealed that both Porsches responded with about the same 30 degrees of car rotation per second of yaw velocity. 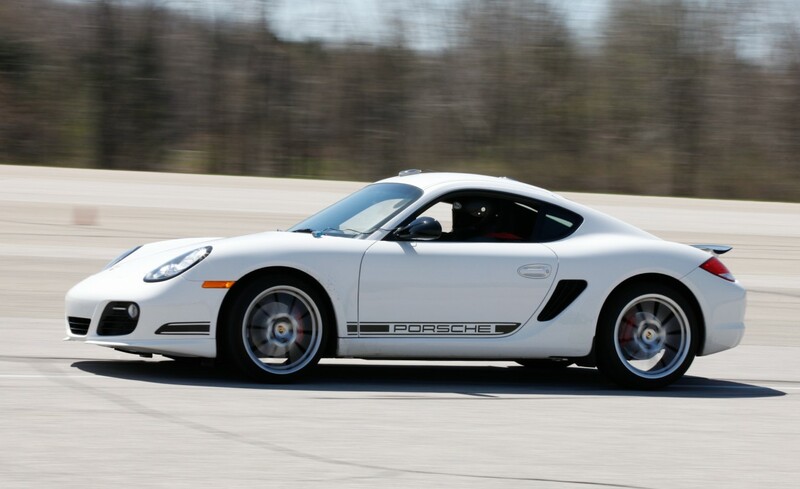 Under steady throttle, the Cayman finally spun at 75 mph. Backtracking a bit, we found that it became nervous at 65 mph with a tendency to drift sideways when full throttle was applied at that speed. When the throttle was abruptly lifted following 90 degrees of steering at 65 mph, the response was a gentle spin. The 911 confidently stepped up the speed ladder to 80 mph before things got dicey. Adding throttle at that speed was no problem. But dropping the throttle at 80 mph made this car extremely loose. At an entry speed of 85 mph, the 911 spun every time. Why? Because the combination of lateral (cornering) and longitudinal (propulsion) loading and the 911’s large polar moment of inertia finally overwhelmed the rear tires. An interesting countermeasure we discovered is that the 911’s electronic throttle is programmed to close with utmost deliberation. This, in combination with a heavy clutch, makes heel-and-toe downshifting a bit of a chore. But the lazy throttle also diminishes the likelihood the 911 will gosideways when a driver lifts in the middle of a tight bend on slippery pavement. Win: Porsche 911 GT3. One of the more revealing tests we conducted was a back-road blitz on a rainy afternoon. Even though the 911 GT3’s Michelin Pilot Sport Cup tires were poorly suited to this task, this Porsche demonstrated impressive wet grip. Front-to-rear balance was commendable, and the 911 never slipped into a scary slide during braking, cornering, or when the two were mixed. However, we had to exercise care adding power when exiting bends because of the steep rush up the torque curve at the engine’s sweet spot. We noted some evidence of sphincter pucker. In contrast, the Cayman R, riding on Bridgestone Potenzas with normal tread depth, triggered no reflexive twitches. While it suffered from a touch more understeer, this Porsche was able to use all of its power and a greater share of its handling prowess thanks to more benign responses, greater linearity, and more predictable general behavior. Better yet, the Cayman easily topped the GT3’s 66-mph best run by more than 2 mph. Win: Porsche Cayman R.
THE RESULTS ARE CLEAR: The grizzled veteran Porsche 911 GT3 won with a score of four victories in five handling tests. This leads us to a number of conclusions. Hoary as it is, the tail-engine layout is still perfectly suitable. Thanks to the six decades of development Porsche has invested in this configuration, the 911’s combination of ample power, exemplary brakes, and tenacious grip lifts the perform­ance bar beyond the reach of the new Porsche Cayman R. In this battle, scrupulous practice conquered sound theory. But had we pitted the Porsche Cayman R against a more pedestrian Porsche 911, the handling tests likely would have been tighter. Or alternately, imagine for a minute a Cayman RS armed with more than 400 horsepower, a nice fat set of Pilot Sport Cup tires, and another dollop of carbon fiber. That would be one awesome Porsche. And one likely capable of finally eclipsing the iconic Porsche 911.